Welcome to our picture Gallery of 33 stunning Hardwood Floor Living Room Ideas. The living room is the most prominent living space within a home, so it is important that it’s designed accordingly. 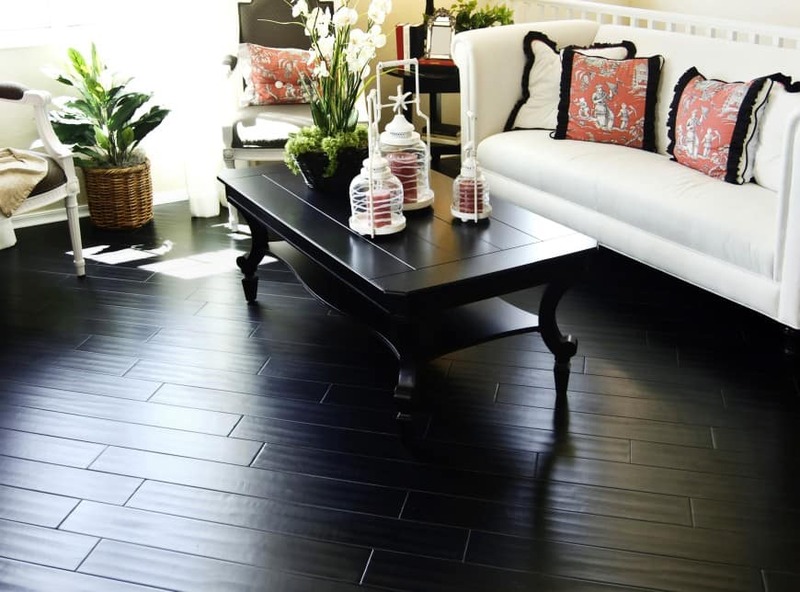 The choice of flooring is an integral part of a living room design. 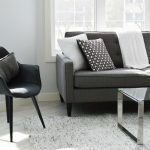 It is relatively simple to replace a sofa or to repaint a wall or two, but a floor can’t be as easily redone. That’s why it is worth to put in a little bit more thought in its design and invest in high quality materials. 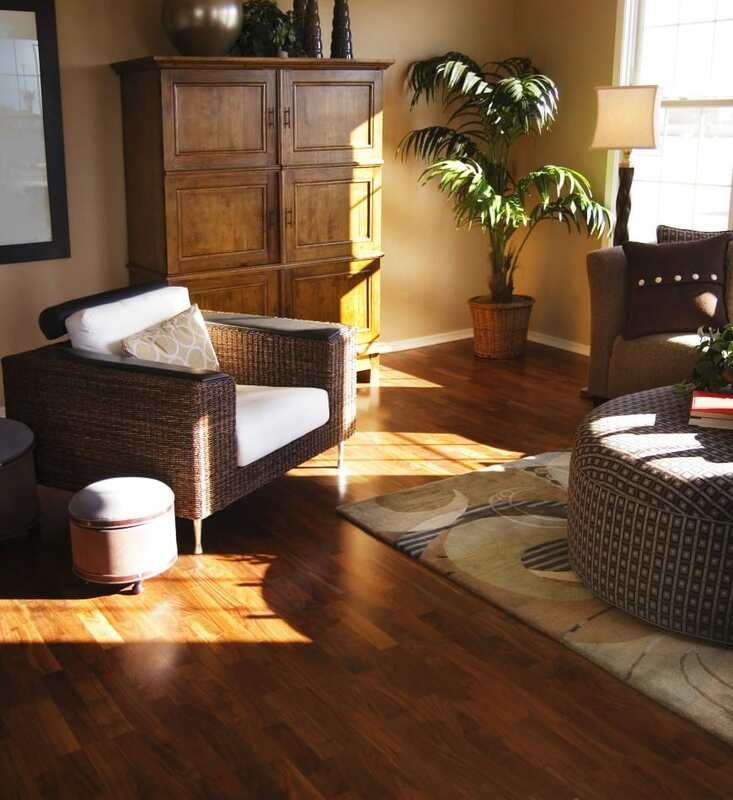 Hardwood floors are a popular choice when it comes to living room designs. It is a natural material that looks beautiful and feels great under your feet. This is also a pretty durable material. If taken good care of, it will be there for you to enjoy for many, many years to come. 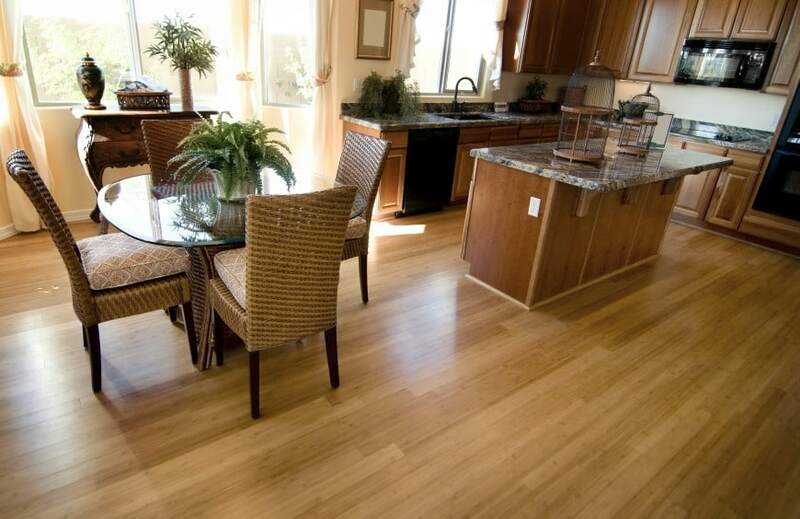 Hardwood is not too difficult to repair, either – all it takes is a little bit of sanding and refinishing. This type of flooring also offers endless design possibilities. Not only can you stain it in different colors, but you can also lay it in a number of ways. You can have your planks run parallel to your walls, or add a little twist by laying them diagonally. You can also create a more patterned look – herringbone, mixed-width and parquet hardwood flooring can all greatly enhance your design. It is also worth mentioning that hardwood floor can add a lot of value to your house if you ever need to put it up for sale. 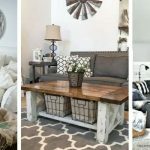 All in all, there are many reasons why you should opt for a hardwood floor in your living room. A picture is worth a thousand words, however, so let’s cut to the chase and move on to our latest picture gallery with beautiful design proposals that all feature hardwood floors. This cozy living room in brown and beige has a traditional appeal. It features hardwood floors and it’s furnished with an L-shaped sofa and a round coffee table. 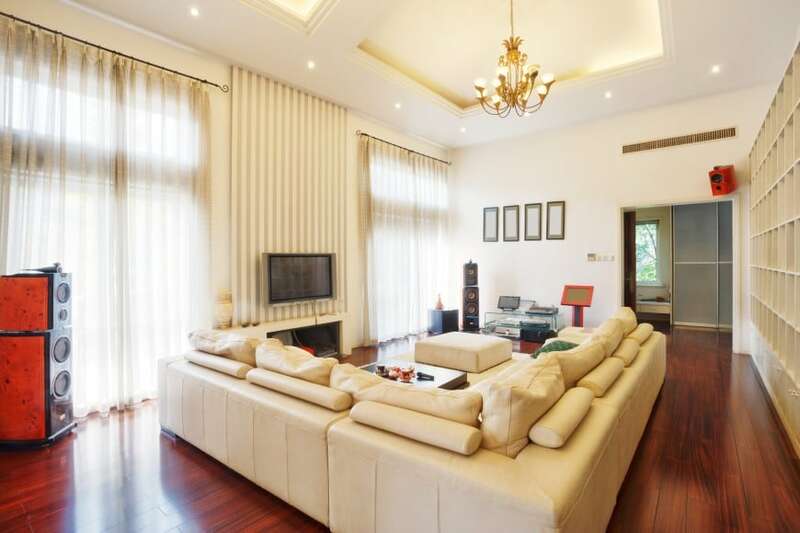 It is also nicely decorated with patterned cushions, wall-hung art and indoor plants. Here is a more contemporary living room design. It features a dark hardwood floor with a beige shaggy rug. The chocolate brown sofa is decorated with patterned cushions that are nicely matched with the beautifully painted walls in green and blue. 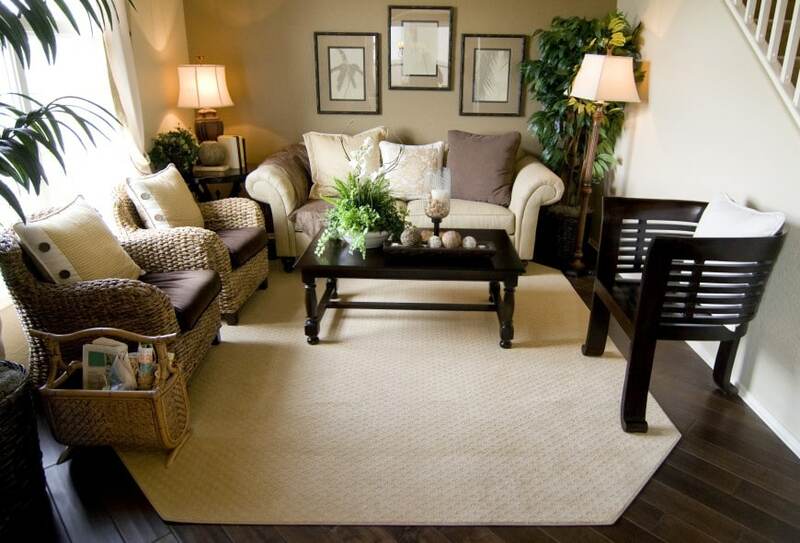 This living room design set in brown and beige looks cozy and inviting. It features a large sitting area that is equipped with two couches and lounge chairs. It certainly is a great place for the whole family. 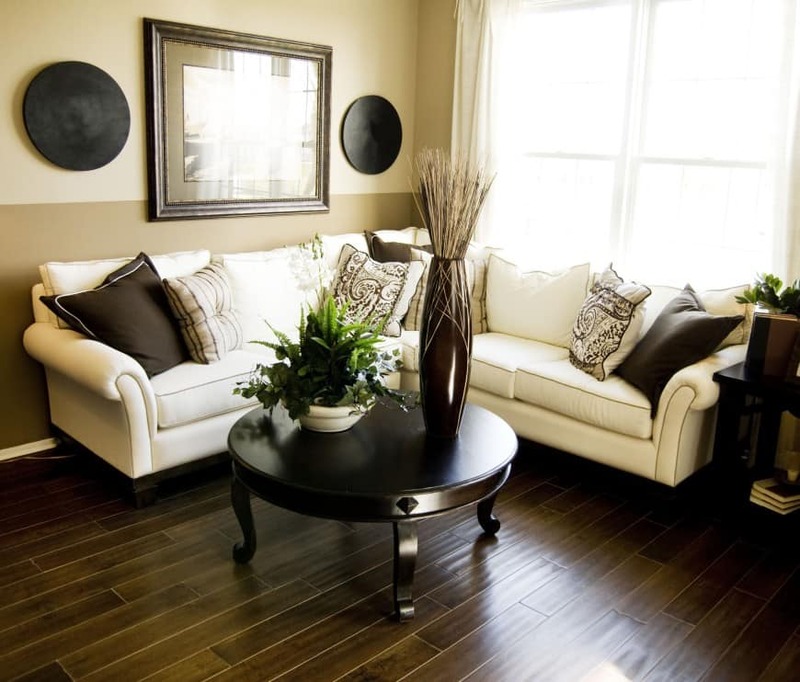 Here is another beige and brown living room design. This design proposal is set in deeper darker shades that make it feel ever so intimate and alluring. 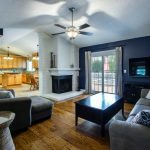 It features hardwood floors with a beautiful rug and a cozy sitting area. 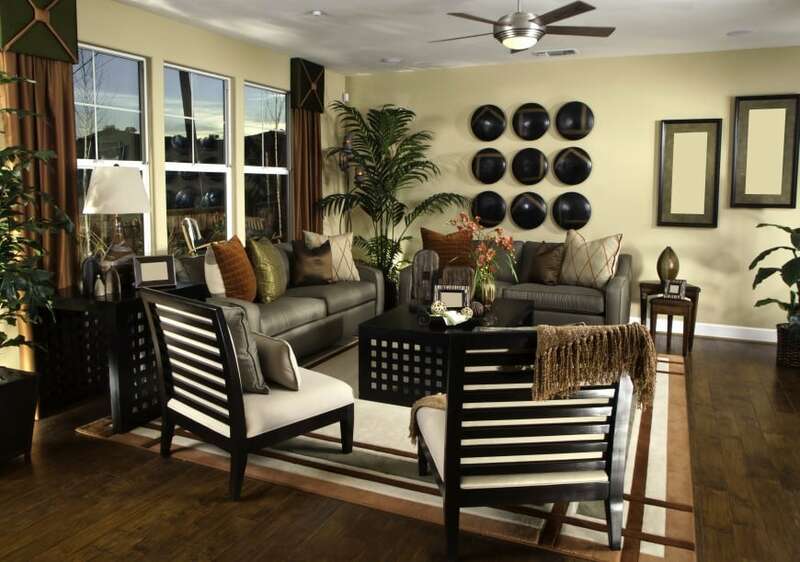 This design, on the other hand, is set in lighter shades that make the whole room look more open and spacious. It has hardwood floors and a stone-clad interior fireplace that makes a great focal point. Here is another light-colored living room design. 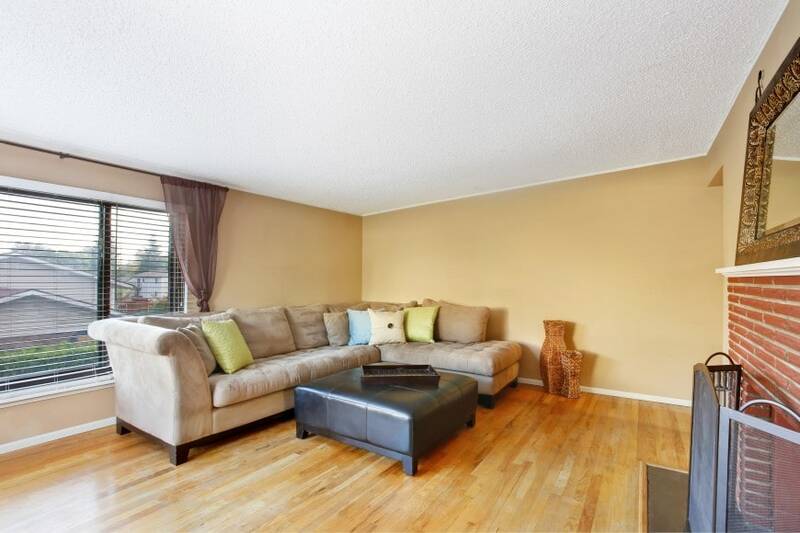 It has high ceilings with accent lighting, and a beautiful hardwood floor. The sitting area in the middle of the room features a large L-shaped sofa in light beige. 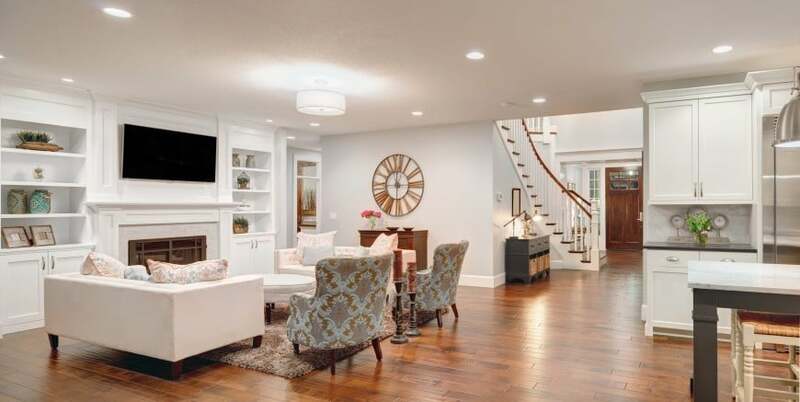 Have a look at one more light-colored family room. Here we have a hardwood-laid double-height living space that accommodates a sitting area, a modern-looking corner fireplace and a large arched floor lamp. Let’s go back to more traditional designs with this proposal. 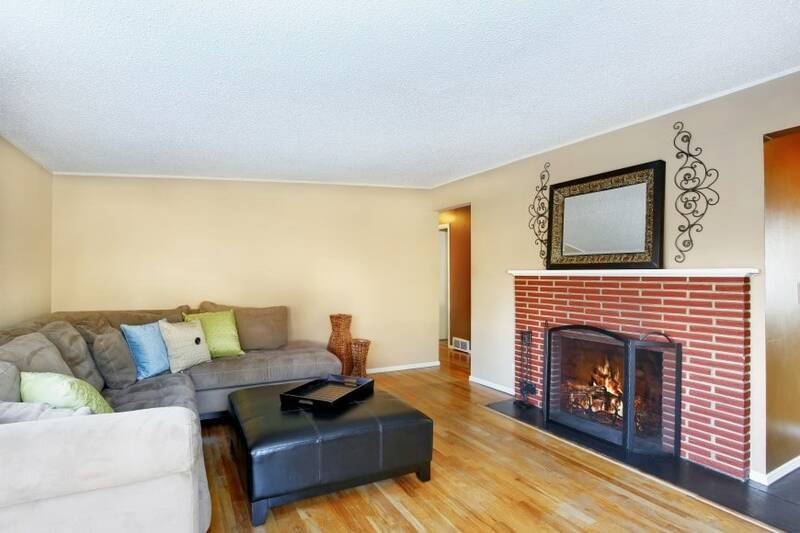 This living room has a beautiful hardwood floor and plenty of windows that open it up to its surrounding area. The whole space is so filled with light that it’s unbelievable. Here is another light-filled living room design. It has a hardwood floor, white-painted walls and a high ceiling. 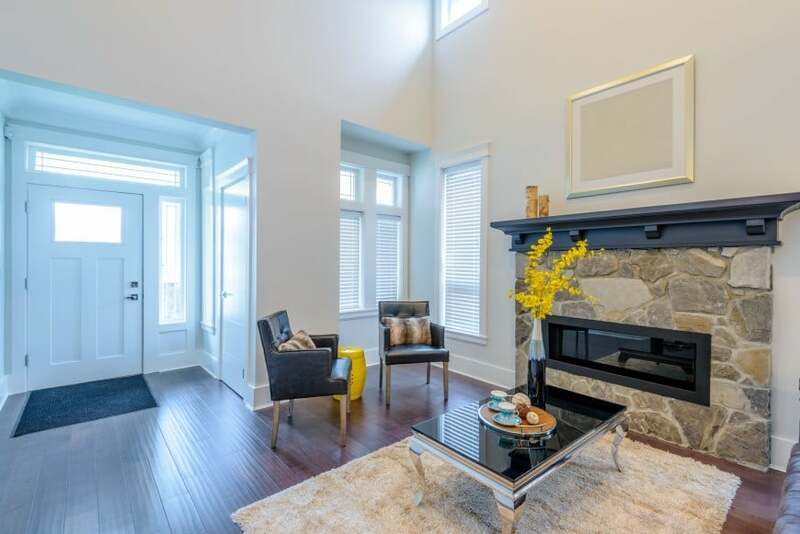 It also features a beautiful stone-clad fireplace with a sitting area right beside it. You don’t need a large living room to be perfectly happy and content. Good things do come in small packages sometimes. Have a look at this cozy little family room and see for yourself. Isn’t it perfect just the way it is? This is a living room found in big mansion houses. If you like to live big, this is a living room that you may like. It has a double-height ceiling, a prominent stone-clad fireplace and a large sitting area complete with a sofa, armchairs and a coffee table. 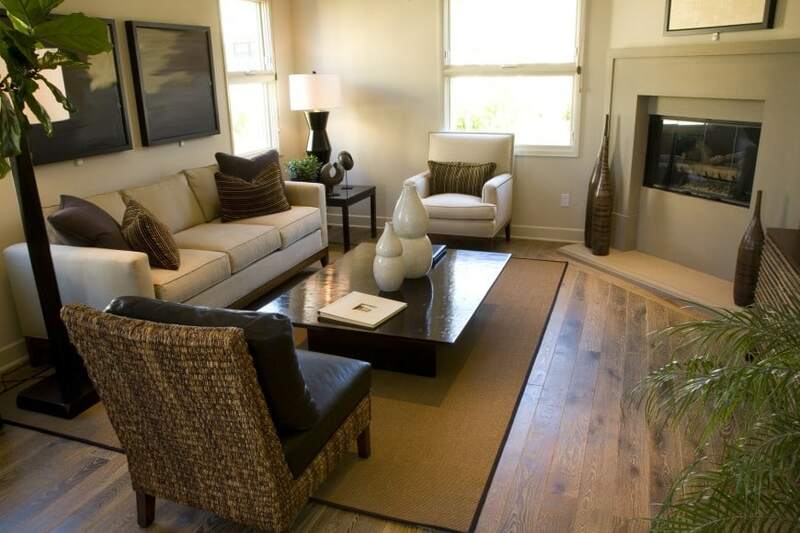 Here is a more simple living room design, that is perfectly nice and cozy. It features hardwood parquet flooring, beige-painted walls, a patterned area rug with a sofa, an armchair and an ottoman coffee table. 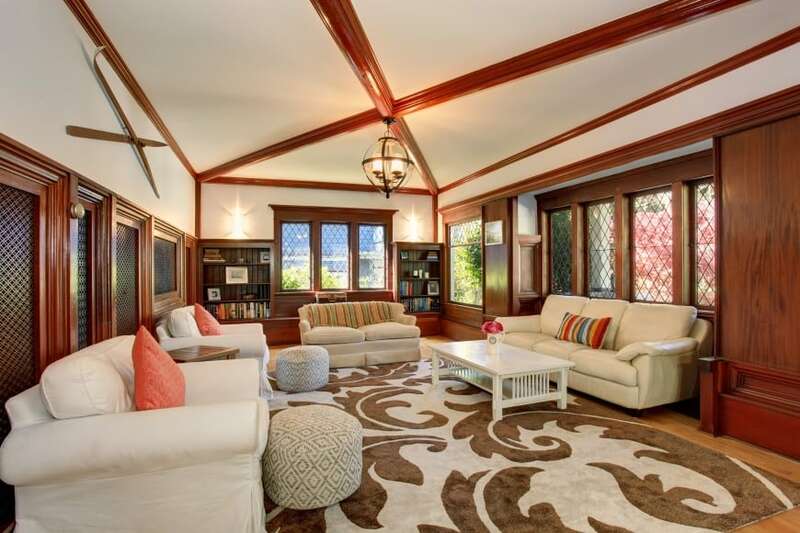 This cozy living room has hardwood floors and large windows. It is set in light neutrals that make it look even more spacious and open. It is furnished with two comfy seater sofas, ottomans and a wicker coffee table. 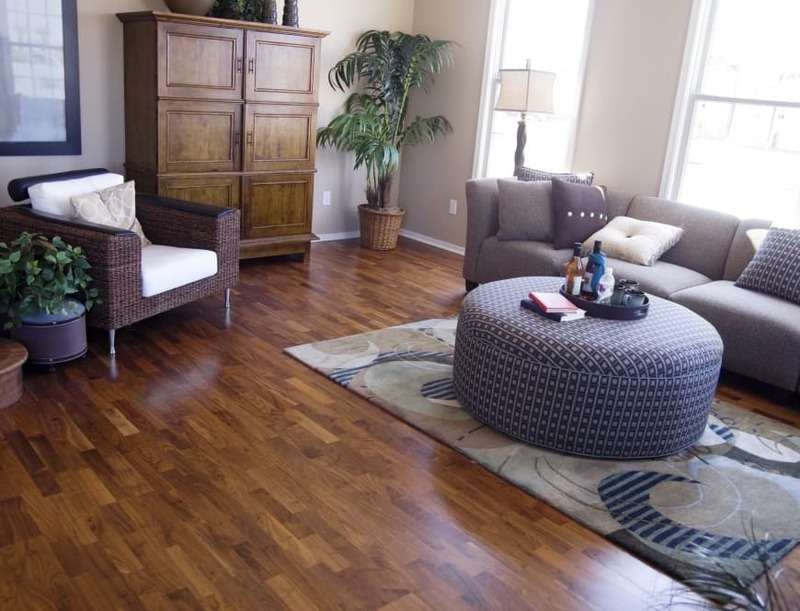 Hardwood is a classic material choice for living room floors. It is so often used in living room interiors, that it could easily get boring. Here is a classic hardwood floor with a twist – it is laid diagonally and has a nice decorative effect. This living room with a diagonal hardwood floor looks cozy and charming. 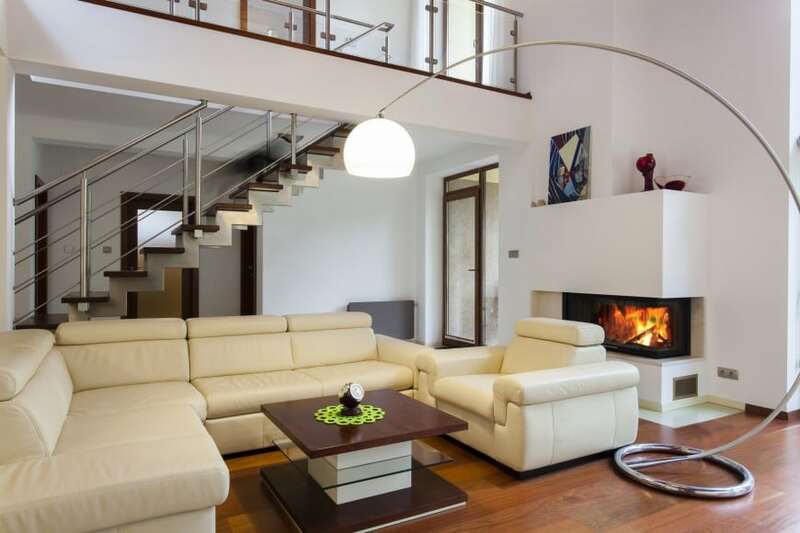 It is furnished with a white two-seat sofa and a pair of armchairs with a classic design. 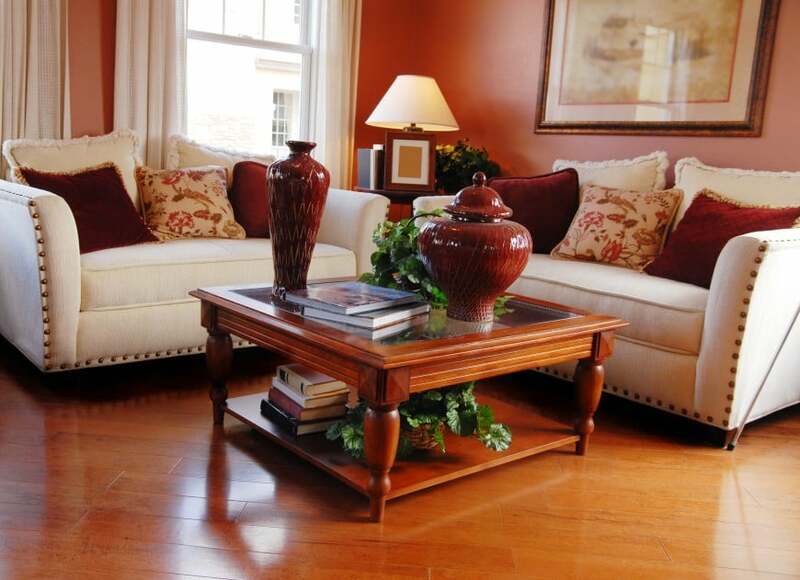 It also features a dark-colored coffee table and beautiful interior decoration pieces. Here is a more basic living room design. 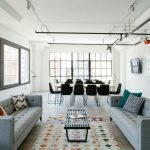 It features a hardwood floor, a popcorn ceiling, beige-painted walls and a large L-shaped sofa with a black leather ottoman table. 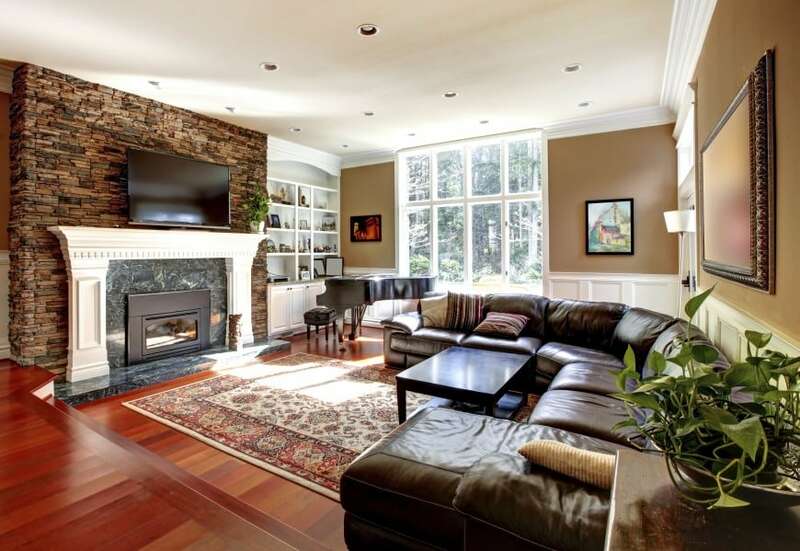 This simple living room design also features a red brick fireplace. It puts a nice decorative touch to a plain design, and really makes a great focal point. It certainly makes the whole room more cozy and warm. 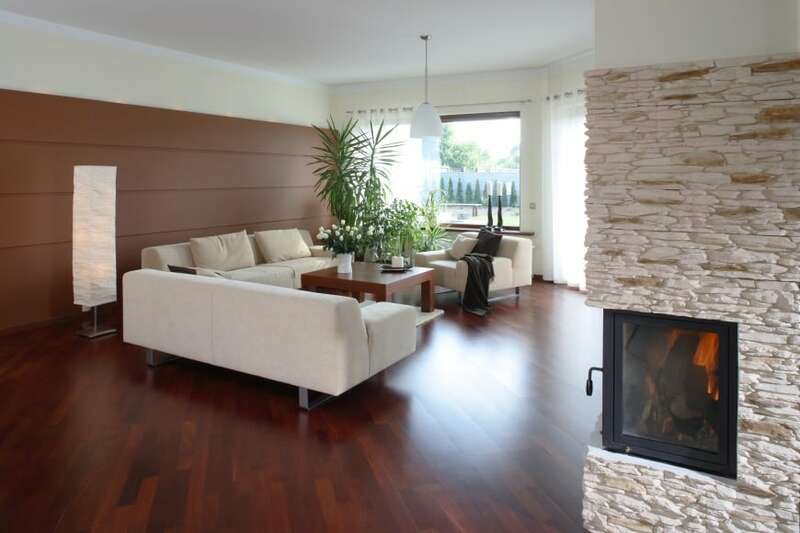 This living room has an open-concept floor plan and a dark brown hardwood floor. 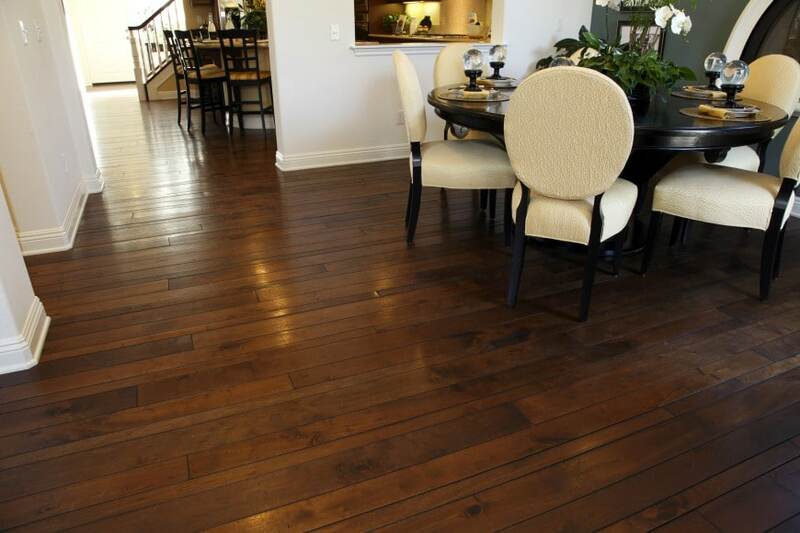 This is not your typical hardwood floor, however. 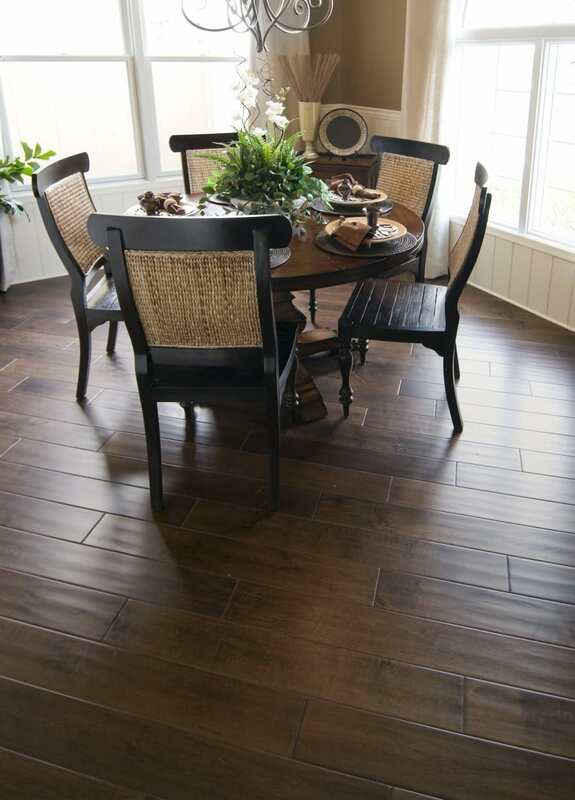 The planks here are mixed and matched – they have different widths and make a cool pattern. 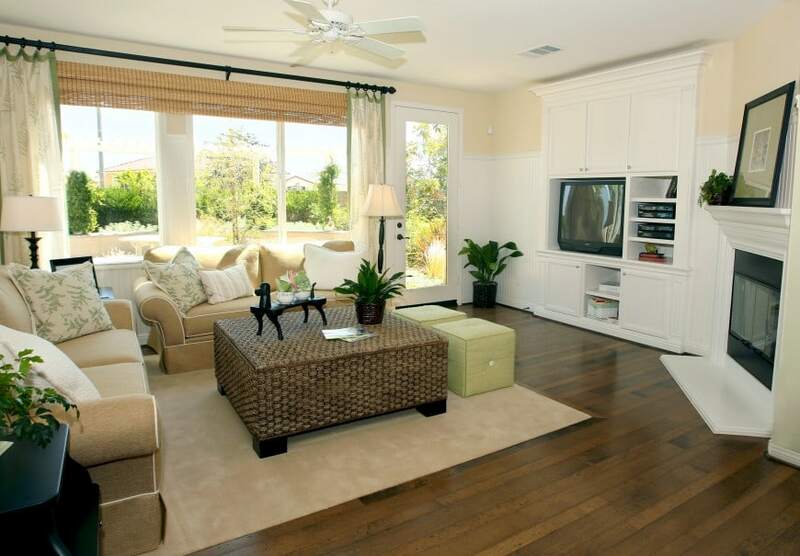 Here is another living room design, this time with a light-colored hardwood floor. This living room has an open concept floorplan that accommodates a sitting area and a dining table with chairs. This dining room area features a dark hardwood floor, wainscot walls and large windows with light curtains. It is furnished with a round table with chairs, and it’s complete with a beautiful chandelier overhead. 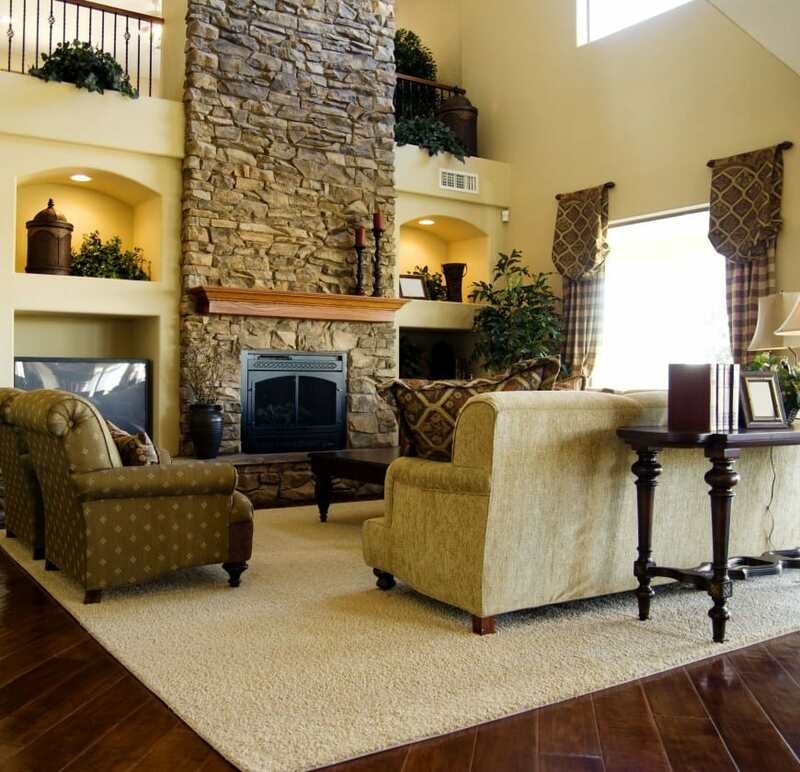 This living room design is set in warm shades of beige and brown that inspire a feeling of comfort and warmth. It features a neat sitting area with a sofa, an ottoman table and a wicker armchair. 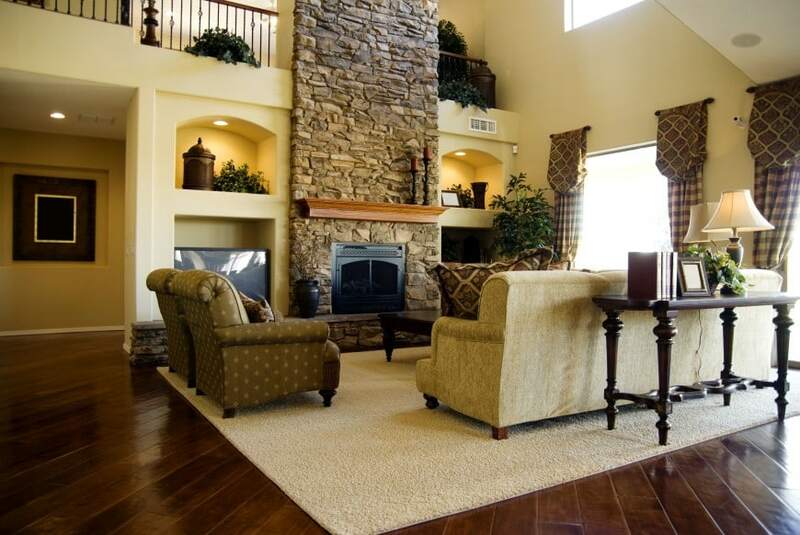 Here is a traditional living room design set in wood and stone. 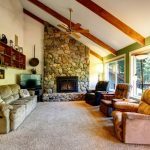 It features high ceilings, a diagonal hardwood floor, a large stone-clad fireplace and a comfortable sitting area in front of it. This open concept living space accommodates a dining area and a kitchen corner. 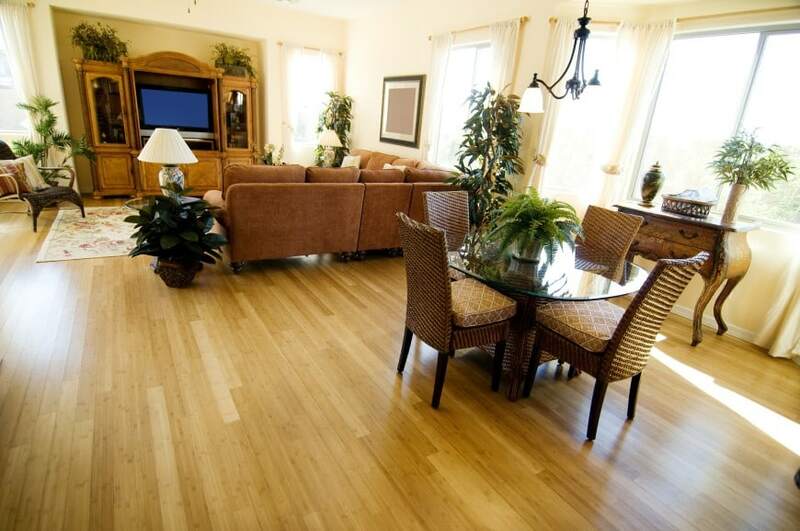 It features a hardwood floor all over and it is set in warm beige and brown colors. It has a lot of windows that let plenty of sunlight in. Have a look at this elegant and sophisticated living room design. 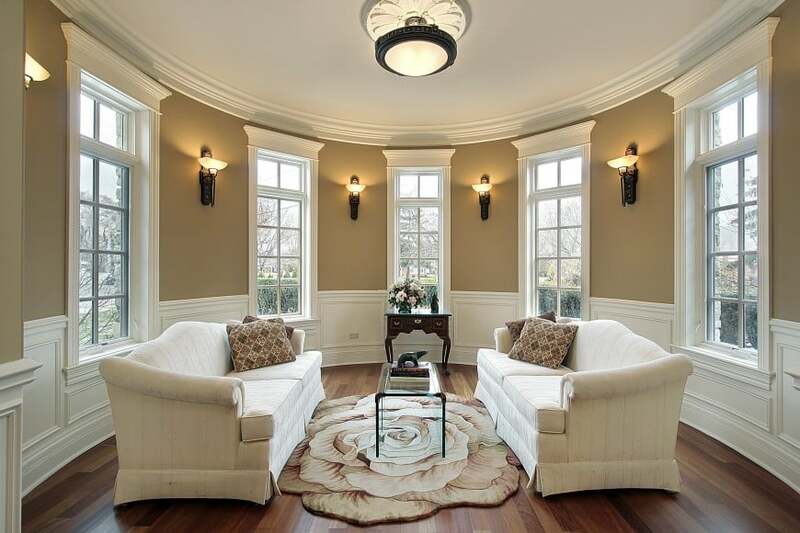 It has a curved wall with large windows and wainscot paneling, a hardwood floor and high ceilings. Furnishings include a sitting area with two white sofas and a glass coffee table. Here is another light and open living room interior design with a modern appeal. It features a whole large window wall, recessed lighting and contemporary furniture pieces. The floors are laid with light-colored hardwood that fits right in. Here is a more traditional living room design. It is set in red wood and contrasting beige. The room is furnished with fitted bookcases and a large sitting area in the middle that features four sofas with ottoman seats and a coffee table. This elegant design solution is set in a fine selection of sophisticated colors. Black, white and dark wood come together to create a beautiful and enjoyable interior setting. The room is nicely furnished with an L-shaped sofa, an ottoman table and a comfy armchair. 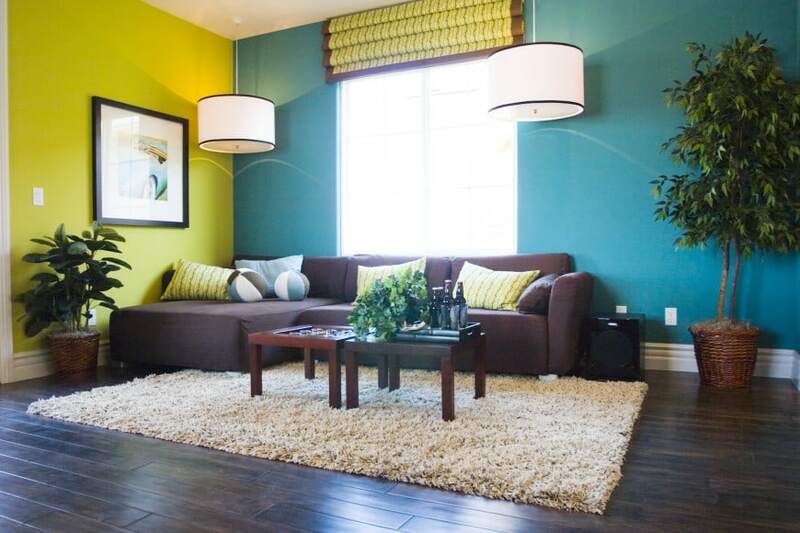 This contemporary living room with a color burst in blue and green is a cool example of modern design. It features hardwood floors in deep brown and a dark-colored sofa that balance out the vibrant colors in the design. Let’s go back to neutrals and browns with this modern living room idea. It features a diagonal hardwood floor, wall paneling and stone cladding. Furnishings include a sofa set with an armchair and a coffee table, a decorative floor lamp and a lot of indoor plants. Here is a living room area with a simple traditional appeal. It has a nice little sitting area complete with a pair of lounge chairs and a wood and glass coffee table. The floor is laid with hardwood, and the walls are painted pink. This transitional design is set in neutrals and natural materials. It features a hardwood floor and eggshell-colored walls, and a sitting area with a three-seat sofa, an armchair, a wicker lounge chair and a coffee table made of wood. This large living room has a transitional appeal. It has a hardwood floor, large windows and a drop ceiling with recessed lighting. It accommodates a massive L-shaped sofa, a beautiful fireplace and a grand piano in the corner. This open-concept living room has a nice flow and a transitional appeal. It accommodates a sitting area with a fireplace and a wall-hung TV. It is laid with hardwood flooring and the walls are painted in light grey.